Hal “shoeless” Fullerton of Arlee launches into the air. Pat Bauerle serves the ball. Rod Hyvonen races toward the finish line. 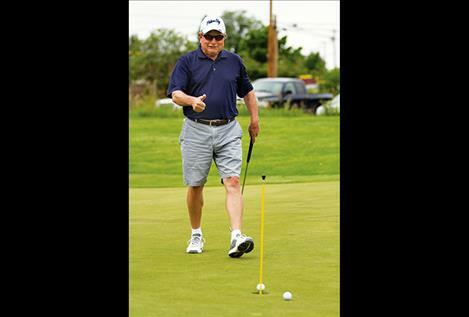 Bob Byers of Polson takes aim at gold. 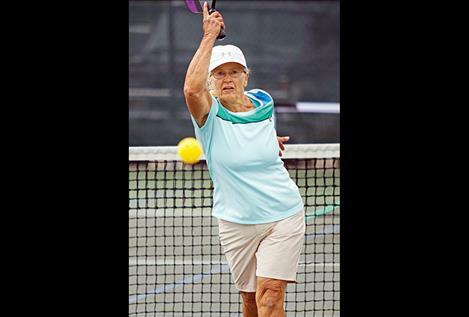 MISSION VALLEY – Some of Montana’s best athletes over the age of 50 made their way to the Mission Valley this past weekend to compete in the 32nd Montana Senior Olympic Games. 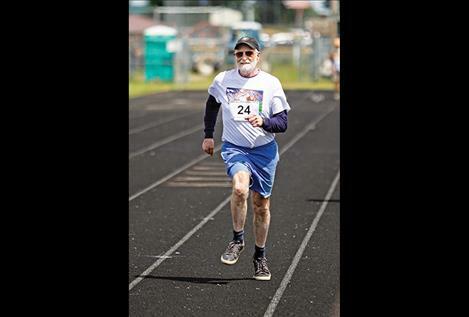 The senior games brought more than 250 athletes along with another estimated 500 family members and spectators to the valley for the three-day event that started on Thursday and finished on Saturday. Athletes competed in more than 14 events that were held at various venues around the valley. Valley venues that hosted events were the following: golf at Polson Bay Golf Course; pickleball, tennis and badminton at Linderman Courts; cycling events at Valley View School; swimming events at Mission Valley Aquatic Center; horseshoes at Cheers; bowling at Sports Page Bowl; archery at Kerr Dam Fields; basketball and table tennis at Joe McDonald Sports Center and all track and field events took place on the track at Ronan High School. Overall, “the turnout was sort of normal for a non-qualify year for nationals,” said Trosello. Next year, the 33rd Montana Senior Olympic Games will return to the Mission Valley with the expectation of more competing athletes as 2018 is qualifying year for national competition. Senior athletes winning gold, silver or bronze in their respective disciplines will qualify to participate in the 2019 Senior National Olympic Games which will be held in Albuquerque, New Mexico in June. Area seniors who did compete, fared well. Pickle ballers Bob and Pat Bauerle won gold in the mixed doubles, while Pat won silver in the lady’s doubles and Bob brought home gold in the men’s doubles. In golf, Tracey Dooley of Polson shot a 76 for gold in his age bracket and won gold in both the driving and putting competitions. 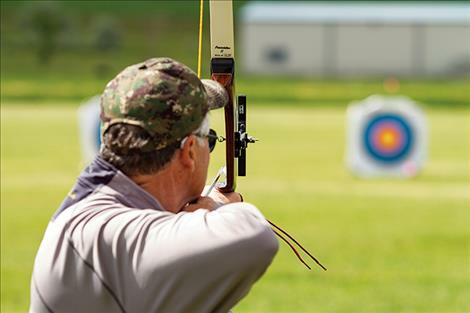 Bob Byers of Polson won gold in recurve archery. 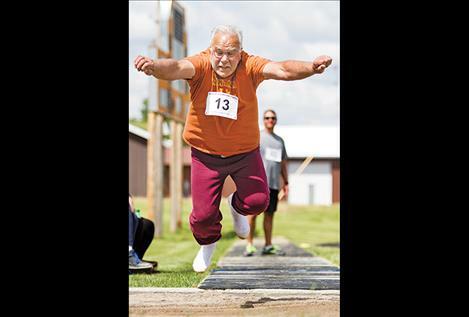 Rod Hyvonen of St. Ignatius brought gold home in the 65-69 age bracket in horseshoes, along with six other metals he won in the track and field events in which he set a number of personal best scores.